It has been a no-good-very-bad week for drones. First an MQ-9 Reaper crashed on a training mission over Lake Ontario, and now the Navy is saying that a target drone helping the USS Chancellorsville slammed right back into it. Good grief. Target drones are regularly used to help calibrate and test weapons systems, because putting an actual guy in a plane while everyone aims at them and everyone hopes nobody sneezes is kind of crazy. 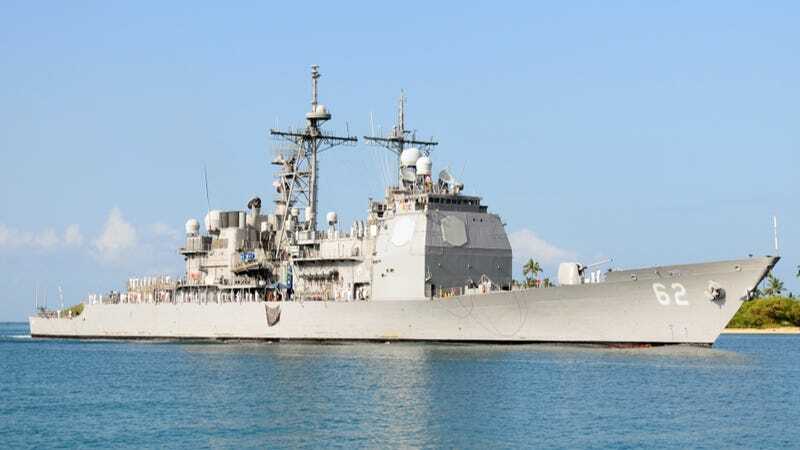 That's exactly what was going on in the late afternoon yesterday off of Point Mugu in California when the drone went on the fritz and slammed right back into the US Navy cruiser, according to USA Today. Two sailors are being treated for burns, which doesn't make it sound like the thing exactly went plunk and bounced off the side. While drones have been around more than 20 years now, they're still relatively new technology and kinks are still being worked out. Let's just hope, for these two sailors' sake, that it's worked out sooner rather than later.